I first got to know the work of Ken Burns over the Christmas Holiday of 1996. We usually made the journey home to Ireland for Christmas but Patricia was expecting and it wasn’t a good time to travel. So we stayed together in London, saw nobody and, without question, it was one of the best Christmases ever. Over that holiday, probably in that rather dead week between Christmas and New Year, BBC2 showed an episode of Burns’ documentary ‘The Civil War’ every morning. After promising myself I would only watch a little bit of the first episode, I became inescapably hooked and ended up watching it all and I’ve watched it several times since, in various viewings, over on PBS. It’s a brilliant, brilliant series. It you haven’t seen it, you should. Over a bunch of long episodes, the American Civil War is evoked through photographs, letters, newspaper reports and other sources. Some of the best voice talents in the world worked on it, the music is unforgettable. The overall effect is one of total immersion in the story being told. I didn’t see any more Ken Burns stuff until last year when one of his newer documentaries ‘The Dustbowl’ came on PBS. Once again, I was hooked. Now I’m at it again. I recently noticed that Netflix has a treasure trove of Burns’ documentary series. I think they may be recent additions but I could be wrong. They mostly focus on times of great human challenge and the best part of them, for me anyway, is the human minutia they unearth. Ordinary people, often now aged, tell their ordinary stories of extraordinary times and the results are invariably moving and memorable. The other night, for instance, I saw that another of the series was showing on PBS. This one was ‘The West’. I only stopped on it for two minutes but, still, the story I heard has stuck with me all week. In rough terms it concerned a massacre of a group of Calvary men by a Sioux war party. Setting aside the niceties of the ‘cowboy movie’ it explained in most graphic detail how the bodies of the soldiers had been ravaged and defiled. All except for one man, the trumpeteer. He fought and fought until he had no bullets left and then he turned his trumpet around and fought with that. When he was killed, the Native Americans laid him out respectfully and wrapped him up in a buffalo skin. He had fought most valiantly as so was treated with care. Little stories like that tend to stick around in your head. At the moment, I am working my way through ‘The War’ on Netflix. It concerns itself with an American perspective on the Second World War and it uses all the now-familiar and often-tropes of the Burns documentary style. Still and all, I’m finding it compelling, informative and moving stuff. I know it came in for criticism about some of the things it omitted from its long running length but I’m not really equipped or informed-enough to deal with that. 'The World at War' may be a more definitive, complete work but 'The War' has lots of real people and small stories in it and that's what makes it work for me. In many ways, I reckon I am the perfect audience for Ken Burns’ work. I never did History in school. To me, it was a dry, dusty old subject that was best given a wide berth. As I have got older, and actual events that I have lived through have themselves slipped into history, I have started to rethink things a bit. History is actually real life stuff, just from another time. There is that rather clichéd view that if we don’t know our history, how can we know who we are. I still don’t quite buy into that one but there is one thing I am starting to believe. I can begin to see that there is a context for our own lives to be found in history, in the lives of those people who lived years ago. Really, now that I think about it, how could there not be? Watching ‘The War’ on my telly has done at least one useful thing for me. It has started to show me how the enormous worries of my everyday life don’t really amount to the proverbial ‘hill of beans’ when held up against the enormous trials that our forefathers had to bear. Ken Burns film about World War 2 gives its account from right down at human level, with the men and women who lived it all first hand. The things they had to endure, the horrors and the pain, make my own 2015 concerns seem smaller and punier than they did before. There's a lesson to be learned there. A lesson beyond the obvious one of respect and remembrance for the sacrifices that were made by my ancestors for my peace and freedom. I owe it to those people to live the best life I can, as unshackled as possible by concerns which are minuscule in comparison to theirs. It's easier said than done but perhaps the saying of it might make the doing of it easier. It’s funny that only now, so many years into my own life, I start to see the value of knowing a little about what went before. 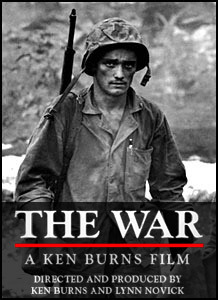 I think I owe that, in part at least, to Ken Burns and his films. It wasn’t that I had no interest in historical subjects; I was simply too young to appreciate them as an academic subject. As a kid I sat with my dad and faithfully watched All Our Yesterdays, at least up to 1973. It was more light-hearted and nostalgic than The World at War which we also sat and watched as a matter of routine. I’ve looked through a list of documentaries by Ken Burns and am pretty sure I’ve not seen any. The last historical series I deliberately sat down and watched was The Seventies which I enjoyed because I was there although I don’t recall life being nearly as bleak as it was presented on-screen. I knew about the miners’ strike, the three day week and garbage piling up in the streets but I guess I was too preoccupied with myself for any of that to be more than background noise which I tuned out. If you asked me for a quote on history the first one that would jump to my mind would be, “The one thing that man learns from history is that man learns nothing from history.” I found it in The Public Speaker’s Treasure Chest which I pawed through as a kid and still have. The older I get the more I see the truth in that statement. History becomes just more background noise to tune out. That was then, this is now. To use another cliché. I remember the nationalistic fervour back in in early eighties and was shocked—there’s no other word for it—that all these young men I was working beside were so ready to yomp off to war over a tiny archipelago which, had most of them been quizzed a few weeks earlier, they would’ve probably said was somewhere off the coast of Scotland. I think it’s dangerous to romanticise the past. People went to war and went without because that’s what everyone else was doing. They weren’t doing it for me. They were following the herd. We still follow the herd. So many of the world’s problems are a result of herd behaviour and indoctrination. It’s easy to point the finger at groups like ISIS but all you have to do is look at America and the number of people who follow Fox News or who believe Donald Trump would be a good choice for the next leader of the (so-called) free world. History is happening right now and (as usual) we’re making a mess of it because that is what we do. This does not mean there have not been individuals throughout history who have stood out. Of course there are and sometimes they make a difference; we take two steps forward and then one back. Just look at the issue with blacks in America right now. Why haven’t we learned? Jefferson gave us the perfect sound bite in 1776 and we like sound bites, slogans, things we can rally behind and there are so many banners people have marched under to bring us to where we are today. Is the world a better place for us than it was for our parents? It depends what you mean by better. My parents made sacrifices for me. I acknowledge that and I’m grateful. They also royally screwed me up. That has to be factored in too. And that’s how history works, individual histories, national histories, world histories.